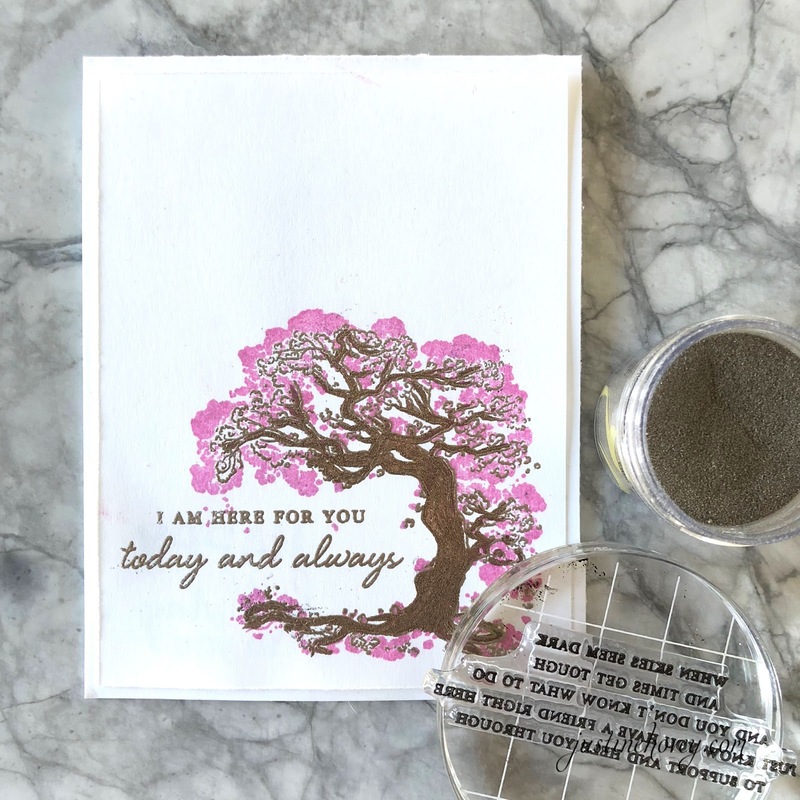 The In My Thoughts Stamp by Altenew is a perfect stamp for making your own sympathy cards! It is a part of the brand new April Stamp and Die release by Altenew. I experimented with adding some extra special touches with layering stamps to get some fun results. I tried both the mirror image stamp and embossing techniques. To celebrate this release, I am giving away. $30 gift certificate for commenting on my blog. Additionally, Altenew is giving away a $50 gift certificate to 6 lucky winners! 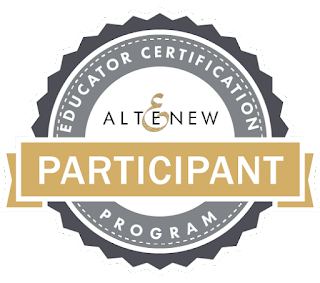 Please leave a comment on the Altenew Card Blog and/or Altenew Scrapbook Blog by Saturday, April 21st for a chance to win. 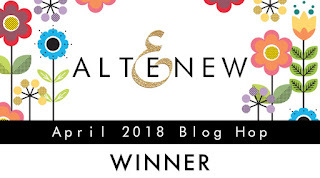 6 winners will be announced on the Altenew blogs on 4/22/2018. 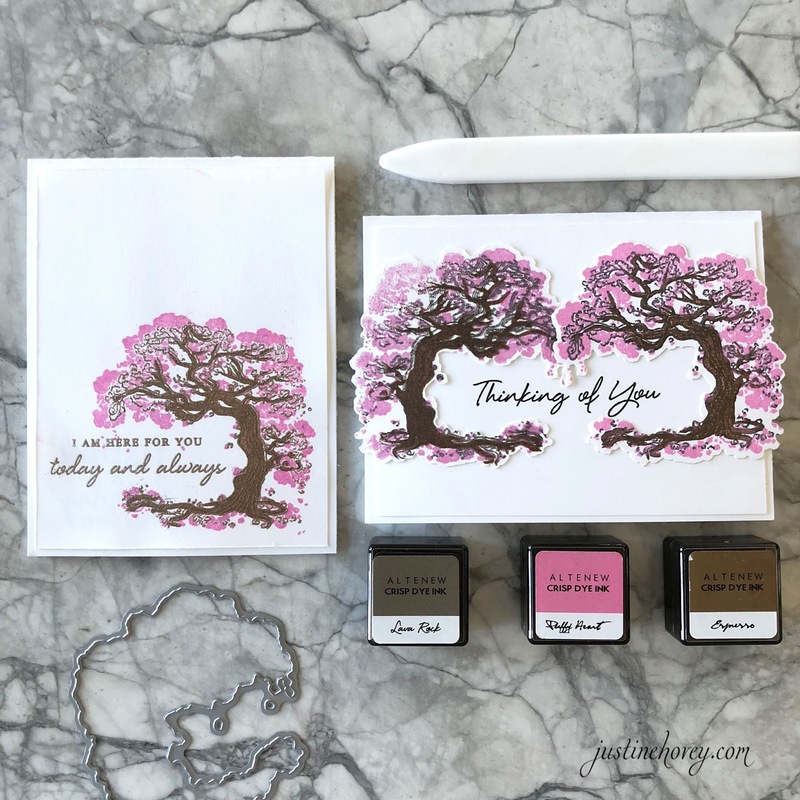 The In My Thoughts stamp has great sentiments for both the inside and outside of the card. I just adore Altenew's unique and heartfelt sentiments that are always included in their sentiment sets. This tree is also very versatile in that you can stamp the flowers around the tree in any colour you wish. You could make this stamp work for any season. I used a Mirror Image Stamp is create a mirror image of the tree. When I looked at the tree, it curved in such a way that I thought it would create a beautiful frame if I mirror imaged it. The layering is not 100% perfect in the mirror image but it is still beautiful. 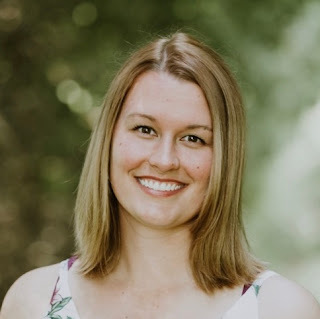 Be sure to check out the other blogs on the hop in order to get a TON of inspiration using the new release. Your next stop is Reiko Tsuchida. I am submitting this card as an entry for my Altenew Educator Certificate. After learning so many techniques in Altenew's "With a Twist" class, I was inspired to try layering in a whole new way with embossing powders!! These are absolutely awesome cards Justine. You explained this technique beautifully! Such beautiful stamps as I have come to expect from Altenew. They do have amazing products! Thanks, Just one for sharing your talent and creativity. The card is beautiful! I like that you let the layered tree stand alone with the sentiment. It feels like it makes the sentiment more sincere. AWESOME creations! Your mirror image tree is awesome! I am totally loving the Mega words! That tree stamp! Love your use of the mirror image to frame the sentiment. Great technique. Great card! Thank you for the mirror image tips. Great mirroring technique. I love that tree! Really love the mirroring technique and the colors, Wow! Beautiful card Justine thank you so much for sharing and a chance to win. Thank you for the tips you shared I love how you cards turned out and the powder is perfect. I have not tried the mirror image technique. Thank you for sharing it with such a lovely card! Hello!!!! Mirror Image just classy! Thank you! Thank you. I have a mat for the mirror image but I have not yet tried it. Thank you for the inspiration. Good Luck!! Beautiful project Justine, TFS I love the Altenew 2018 release. Wow! Your cards were great. Loved the colors you used for Spring time. Thanks for sharing and have a wonderful week. Absolutely great job! Thank you for sharing. Pretty cards! Thanks for sharing them. Gorgeous cards!! Love the layered embossing! Lovely cards Justine! Such a pretty stamp set and sentiments. Thanks for sharing your creativity. It's appreciated. Thanks for showing the mirror stamp technique. Wonderful cards! Oh, that tree set is so pretty! Love the colors you used! What a great mirror image technique! 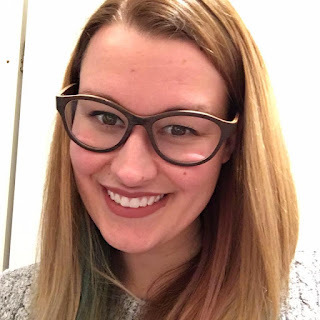 I'm so happy to see you on the hop, Justine! Your cards are gorgeous!!! Great idea to use the tree on both sides! Beautiful card and dies, love them. Really love that card reminds me of the cherry blossoms in Washington DC. Good luck on getting your certificate. I know you will succeed. Your tree cards are so beautiful. Your cards are lovely. Thank you for the inspiration. Very pretty... this tree stamp is awesome. Beautiful card....this stamp set is wonderful. Your mirror image is wonderful. Best I get out that stamp again and try it. Gorgeous cards!! I love the tree dies!! Thanks for the inspiration!! That is one beautiful stamp set. Not sure I am brave enough to try mirror image technique with a layered set, but it does frame the sentiment beautifully. Thank you. Your cards are so beautiful....Thanks for sharing!! Great, fun, and vibrant cards! Love the tree mirror card the most! Oh my! These cards are beautiful!! My fav is the one with the embossing powder but I like them all! Btw, I don't know if its just me, but the video that came up in your post was the Altenew Washi tape video from last week. I had to go to Youtube to see the correct video. Not only is this tree beautiful, but the set has such lovely sentiments. Love your mirror image idea and the colors you used to bring everything to life. I love your cards Justin, this tree stamp is so unusual. I love the mirror image and have just though could the mirror image stamp be lined up on the first tree that was stamped to make it easier, I suffer with poor eye sight and if it is worth trying that. I love that tree. thanks as always for sharing. Lovely cards and thanks for the video. Love your card and video! Lovely card. The browns and pink look so pretty together. So unique! I love the colors you used. Thank you for sharing. I’ve been wanting to learn how to do “mirror stamping”, so thank you for the great tutorial! Love the color choices, and the stamp set is gorgeous! Congrats Alli! 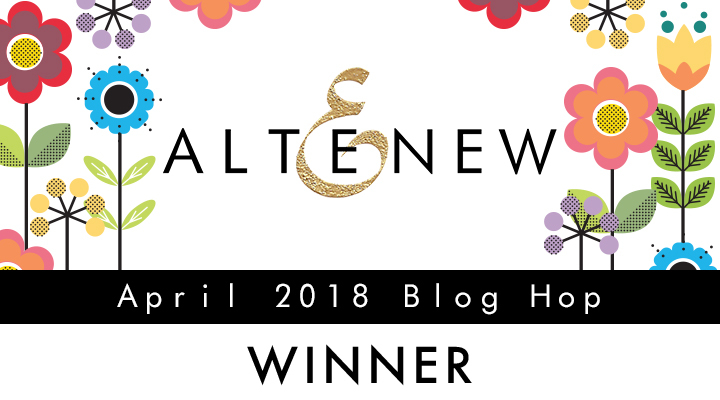 You won the Altenew giveaway for $30. Please contact me using the contact form below and I'll give you instructions on how to claim your prize! Thanks for commenting and playing along with us! Love the mirrored tree image. This stamp set is so pretty. I love your mirror tree card. Beautiful cards. Have received so much inspiration from everyone. Thanks. Thank you for the tips on mirror stamping! So pretty. I need to try mirror stamping. Beautiful work Justine - especially the mirror image. Great Mirror Image Technique!! So pretty and also my Most favorite Stamp of this release!! TFS!! This is a beautiful stamp set. Love your video and creativity! Loved how you used a mirror image to frame your card. Very creative. Thanks for sharing. Beautiful! Love the soft pinky colour. Creating a frame for the sentiment with the mirror image was a great idea . 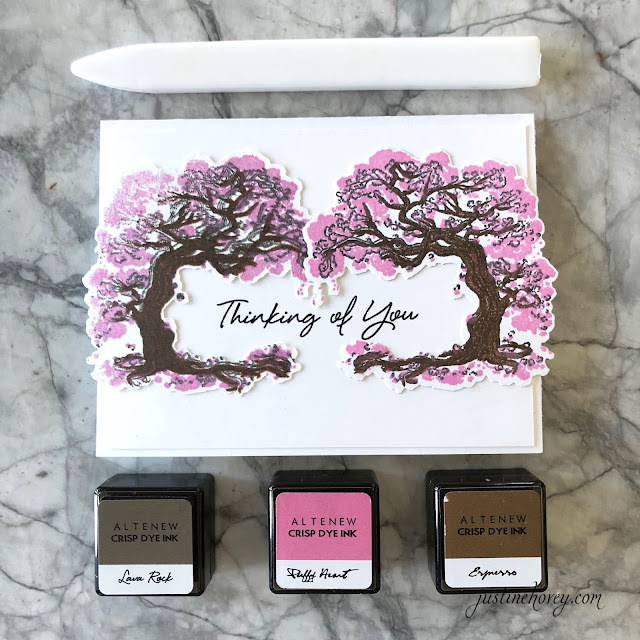 Altenew really does have amazing sentiment stamp sets with heartfelt words. beautiful cards with this new stamp set, Justine! Such beautiful cards, Justine! I hope you get the certificate! I love your creations and videos. Your video was really helpful. The card is beautiful! Beautiful card! Love the pink with the brown and the embossing. So pretty! Very pretty card... perfect for a sympathy card. Thx for sharing and a chance to win! Gorgeous cards, Justine! Love the tree stamp. Fantastic cards! I love the mirror trees! Absolutely beautiful cards! Love the mirror technique! In my thoughts is a beautiful set and I love they way you did the mirror image of the trees. Great design. Beautiful tree card with the mirror imaging! TFS! You are always so full of good ideas! I love the mirror image! I can’t wait to try it! I'm in love with this card, and the stamp set. Just beautiful. Like how you reversed the second tree to make like hands holding your sentiment. Very cool idea! Wonderful cards Justine. I really love the stamp, but I hadn't until I saw how you did it and how it comes together so beautifully. I prefer the solo tree, the other seemed a tad busy. But then it grew on me. You do such good work! I totally agree that the stamps set is perfect for sympathy cards. Those are always so hard to find good designs for. Gorgeous cards Justine! I love that you did the mirror image stamping and showed how much it really takes to do it right! The card turned out great! And the one you did with the embossing powder is stunning! Thank you for the inspiration! Stunning cards, Justine! The In My Thoughts stamp/die is one of my favorites. Love the mirror image. Haven't tried that technique as yet, but you've inspired me. Justine, your tree cards are stunning! I can't wait to watch the video to see how you made those trees! Thank you so much for making the video...so helpful!! Love this card. And your video is great! Beautiful mirror image trees, love your pretty card and thanks for another awesome video tutorial! Beautiful card...love the video! Was on the fence about that layering tree stamp but think I may have to get it!! Great card! Great technique!Thanks for video. The layering tree card is just beautiful! I like the card with the embossing powder. It's so nice! Loving the mirror stamping and the embossing! Congrats on your class completion! Very beautiful cards. Love the new release, especially the huge sentiments. Justine, these cards are just so pretty! You explain each step so well and make it so easy for us to give these new techniques a try. I'm really interested in attempting the mirror image! Thank you! : ). Isn't this new release amazing? Justine I loved watching your video!!! And I love how creative you were to use the mirror image of the beautiful tree stamp to create a little pocket for your sentiment. You always have such great tips and techniques I love learning from you! <3 thank you! What a remarkable card and In my thoughts stamp image of the tree! Fabulous new release and you have done such a fabulous job with it! In My Thoughts is one of my absolute favorites from this release! Your cards are awesome! Especially the second one. The two trees together make me think of a heart! TFS! This release ROCKS! I love the reverse image idea! Great tutorial! Thanks for explaining reverse image stamping with layering stamps. Your cards are beautiful! I love the addition of the embossing powder on leaves of the tree. Wonderful cards! Love the beautiful trees framing the sentiments. Wonderful card!!! This is an amazing new Altenew release!!! So pretty! Those colors are yummy!! In My Thoughts is such a special set. You have showcased it beautifully with your cards. Thank you. Very pretty card. Love pink! That layering tree is so lovely and you showcase it very well in your two cards. Beautiful trees! Love how you framed the sentiment on the second card! What a great mirrored image technique! Thanks for sharing! I like how the tree/s frame the sentiments. Lovely work. Thanks for sharing your techniques. Gorgeous card--love the tree stamp, so pretty! Beautiful! This release is so amazing with many possibilities! Thanks to all! Beautiful stamp and technique! Thank you for sharing! Beautiful cards, elaborate but simple at the same time. 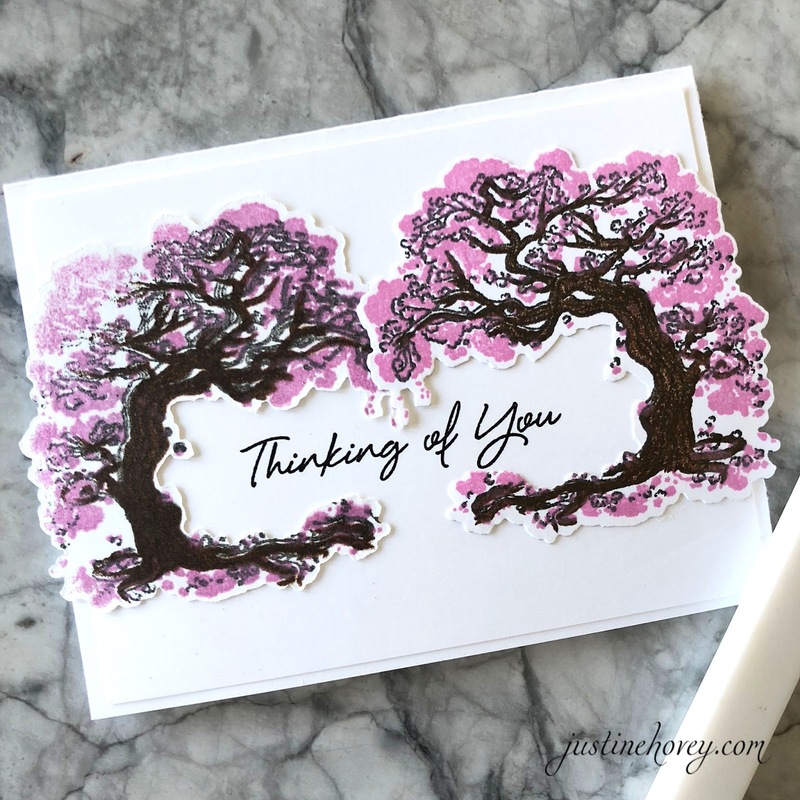 That tree is so perfect for thinking of you and sympathy cards. Lovely card.. 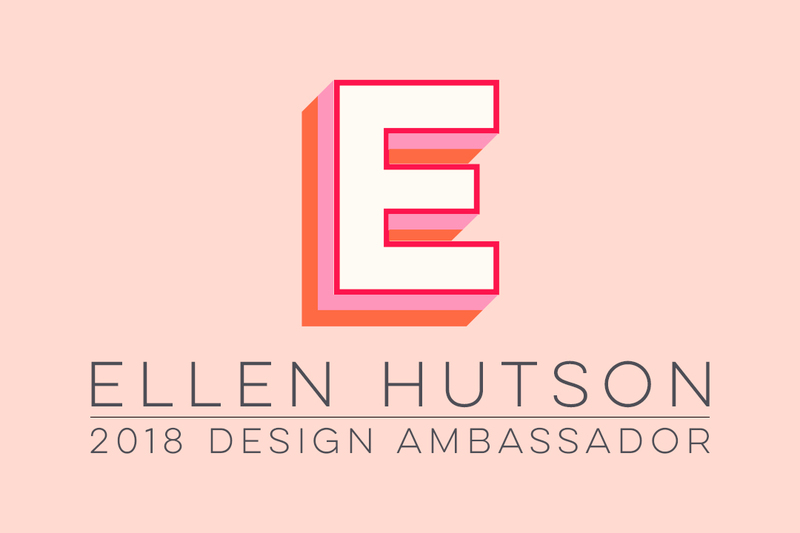 Thank you for the inspiration, and congratulations to the winner! Ingenious design, Justine! I love how you flipped the images! So cool and beautiful! I am so glad that you enter your beautiful work in Altenew AECP assignment Gallery. Awesome details and design! Super work!